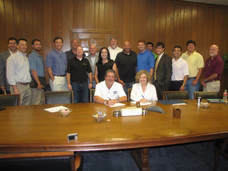 In 2014, Louisiana AGC signed an Alliance with our local OSHA partners The Alliance formed a collaborative relationship to foster safer and more healthful workplaces. ​Recently AGC named Lance Roux, CSP with SafetyPro Resources, LLC our statewide Safety Consultant. Lance and his team are willing and able to provide a vast array of services to your company. This working committee of Safety Professionals meets on the last Thursday of every other month and is always open to adding interested members. Please contact Michael Demouy at michaeld@lagc.org or 225-344-0432 for more information. Click on the link below to find the 2017 National AGC Safety Awards (NASA) Participant Form for Louisiana AGC (Chapter Code 20E). This Program has been an ongoing effort since 1991 to offer AGC members an opportunity to evaluate their safety record. NASA compares a member’s safety record with other AGC members and compares the record according to the member size and construction type. NASA also provides a great opportunity for contractor members to compete for nationally recognized awards with excellent safety records. Eligibility: A company must participate in this NASA Program for three consecutive years in order to be eligible for an award. Company must have participated in 2015, 2016, and 2017 to be eligible for an award in 2018. Participant’s Instructions: Complete your OSHA Form 300A “Summary of Work-Related Injuries and Illnesses” for 2017. Review your OSHA Form 300A noting Section (G) “Fatality Information”; Section (H) “Cases with Days Away from Work”; Section (I) “Cases with Job Transfer or Restriction”; Section (J) “Other Recordable Cases” and the “Employment Information” section for your company work hours. Then, transfer the total work hours, total number of entries, and number of fatalities on the attached Participant Form. Once you have completed the attached Safety Awards Participant Form, return it to Louisiana AGC via email (debbieh@lagc.org), fax 225/344-0458 or mail no later than FEBRUARY 9, 2018, so that we can forward this information to our National office. If you have any questions, please feel free to email or call me at 225/344-0432.